62 Landscape Architect and Specifier News 2016 Specifier's Guide park & recreation Water-Oriented Play (Continued on page 64) See Ads on pages 47, 90 Information Request # 9028 Water Odyssey 512-392-1155 waterodyssey.com Create unique water features and environments with aquatic play solutions from Water Odyssey™ by Fountain People. From Fun Forms™ themed aquatic play features (shown right), to Color Cast™ architecturally-inspired spray features (shown left), we will help you create unique water feature experiences that promote fun and family togetherness. See Ad on page 71 Information Request # 9030 Waterplay Solutions Corp. 800-590-5552 waterplay.com Kids get to splash, spray, slide and repeat at the new Garside Pool in Las Vegas. Possibilities for adventure are endless with the desert themed slide activity centre _ that is, if you can sneak past the water spewing cobra and horse on guard. The exciting play features - including two snaking waterslides - were part of an $8.1 million renovation of Garside pool, originally built in 1971. The revamped facility opened its doors in June 2014 and now accommodates up to 600 visitors. See Ad on page 79 Information Request # 9113 Empex Watertoys 866-833-8580 watertoys.com Put some real excitement at your facility with an Empex Aquadunker! The colorful tub fills to the top, then tips out completely sending a huge cascade of white water down. Both kids & parents love to be front row center when the tub dumps. 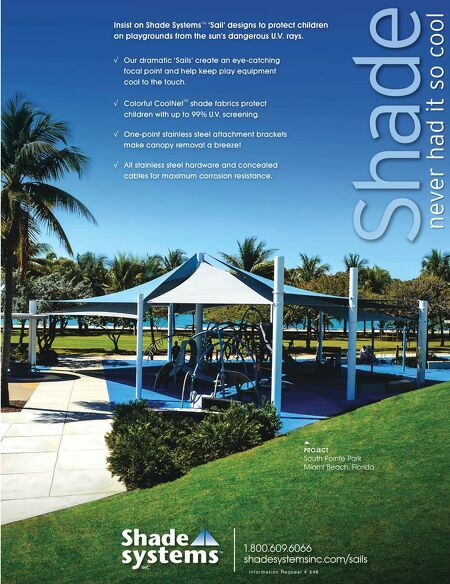 World Premiere See Ad on page 77 Information Request # 9195 Vortex Aquatic Structures Intl. 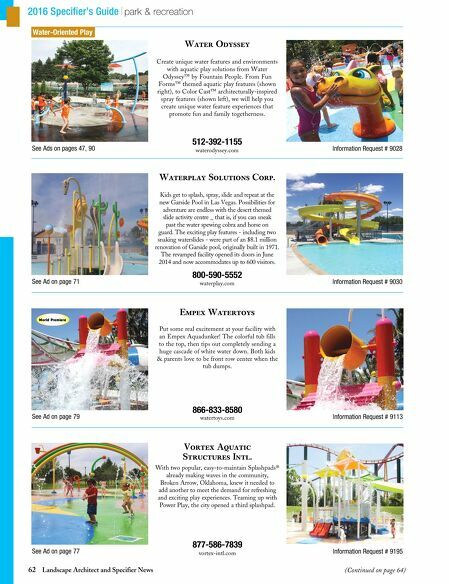 877-586-7839 vortex-intl.com With two popular, easy-to-maintain Splashpads® already making waves in the community, Broken Arrow, Oklahoma, knew it needed to add another to meet the demand for refreshing and exciting play experiences. Teaming up with Power Play, the city opened a third splashpad.